Much of the news that circulates regarding the state of education is not positive, but one trend that remains under-reported is the significant rise in public high school graduation rates during the past decade. By the end of this month, around 85,000 high school seniors are expected to have graduated from Virginia’s public schools.That is nearly 8,000 more than would have been expected to graduate just a few years ago. Who is driving the increase in graduation rates? Graduation rates (the percent of freshmen who graduate four years later) have risen among all student groups since 2008 in Virginia. But much of the rise in graduation rates came from gains among student groups that have had low graduation rates in the past. Graduation rates for Black and Hispanic students rose much more than rates for White students, and the rates for students from low income households increased more than any other group. Across Virginia, high school graduation rates have risen the most in the rural and urban school divisions that had low graduation rates in 2008. Urban school divisions made up over half of the 25 divisions with the largest gains in graduation rates. In Roanoke and Portsmouth, graduation rates rose over 20 percent between 2008 and 2013. While graduation rates fell in only a handful of places, school divisions with high graduation rates to begin with, such as Bath and Falls Church, had much smaller increases. The recent rise in Virginia’s graduation rates has been far reaching — not only pushing up graduation rates in under-performing school divisions but also increasing graduation rates in school divisions with rates closer to Virginia’s average. Six years ago, there were 28 school divisions with graduation rates below 75 percent, now there are none. During the same period, the number of school divisions with graduation rates above 90 percent increased from 11 to 53. Nationally, high school graduation rates have also risen in recent years, after declining and remaining flat since the 1970’s. Many attribute the recent rise to changes in education policy, but graduation rates have been rising in most developed countries. 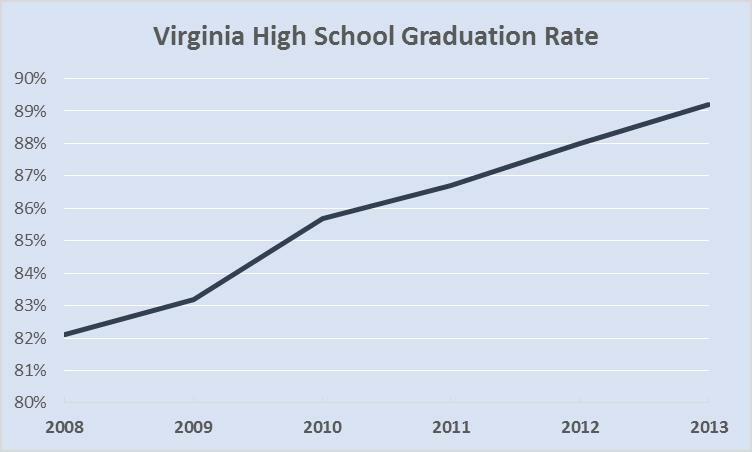 However, because Virginia recently adapted its methods for measuring graduation rates, it’s difficult to track trends before 2008. 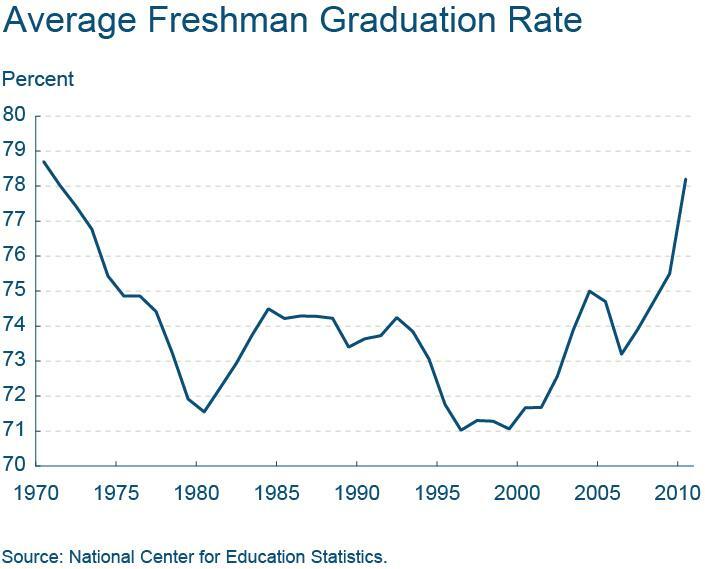 While the recent rise in graduation rates appears to be connected to the recession, the chart below made by the Cleveland Federal Reserve Bank shows that much of the rise in graduation rates nationally occurred before the recession began. During the early 2000’s, teenage pregnancy and youth crime rates both fell considerably, allowing more students to stay in school and remain on track to graduate. In the late 2000’s, youth unemployment rates also rose because of the recession, making dropping out less appealing. 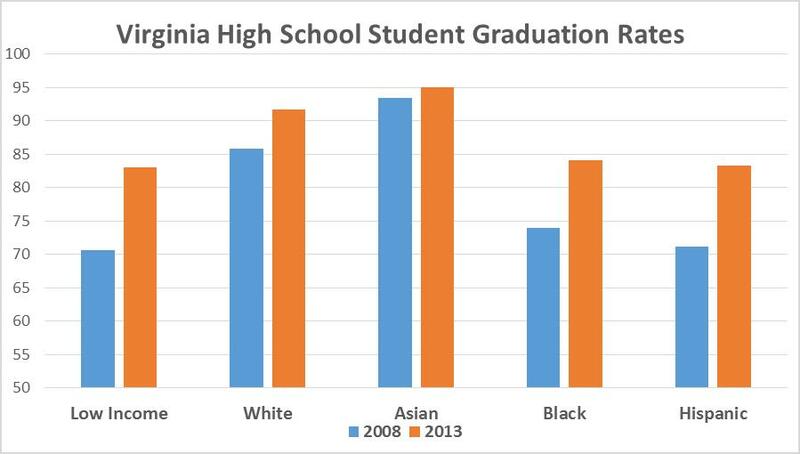 Rising high school graduation rates is certainly good news all around. Unemployment rates for high school graduates are consistently lower than for dropouts, and graduates earn considerably more money. In addition, two thirds of last year’s high school graduates enrolled in college in the fall, while only 1% of high school dropouts enrolled in college. For colleges, the rising high school graduation rate is also good news. A decade ago, many colleges saw the increasing pool of applications from Millenials as an opportunity to expand, but since most of the Millennial generation is now past college age, many colleges have struggled to maintain or expand their enrollment. A larger number of high school graduates will likely increase the number of college applicants as well. Most school divisions in Virginia also experienced declining student populations after the Millennial generation passed school age, but the increase in the number of students staying in school to graduation is helping slow the decline in enrollment. In a number of school divisions, such as Suffolk City and Buckingham County, more students staying to graduate has been the difference between a stable student enrollment and a declining one. Given that Virginia’s graduation rate in 2013 was still below 90 percent, a good deal of upside remains, particularly in poorer rural and urban school divisions. Page County increased its graduation rate from 80 percent in 2008 to 98 percent in 2013, while half of its students were living in low income households. Repeating Page County’s feat won’t be easy for other school divisions, but given the substantial increase in graduation rates across Virginia, it is very possible.